Join the NBC Monitor communicators as they report the nation and the world and bring you comedy, music, interviews and much more from 1955 to 1975. 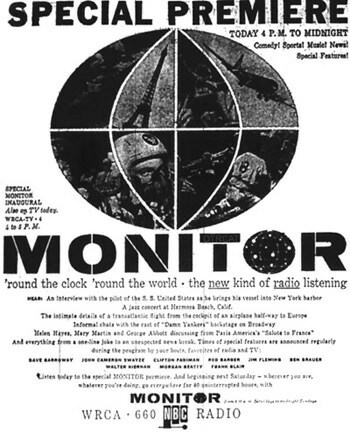 Monitor was produced by NBC beginning in 1955, ending just four months shy of it's 20th birthday. " Monitor Beacon" refers to the signature sounds that introduced the show which were manipulated telephone sounds with Morse code in the background signaling the letter M for Monitor. When the show was introduced in 1955, it was broadcast simultaneously over the radio and on television beginning at 4 PM and ending at midnight. The regular schedule, however, was 8 AM Saturday mornings through midnight Sunday. 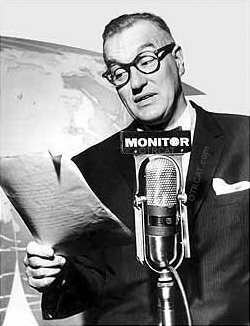 The show was created by NBC president Sylvester L. (Pat) Weaver and, some believe, was the forerunner of talk radio. The format was different for the time and Weaver called it "the radio pattern of the future" in his introduction to the program. The format was a mix of news, sports, comedy, music, interviews and more. There was nothing like it at the time and was a total divergence from traditional radio programming with 30 minute and 60 minute program segments overseen by a communicator. 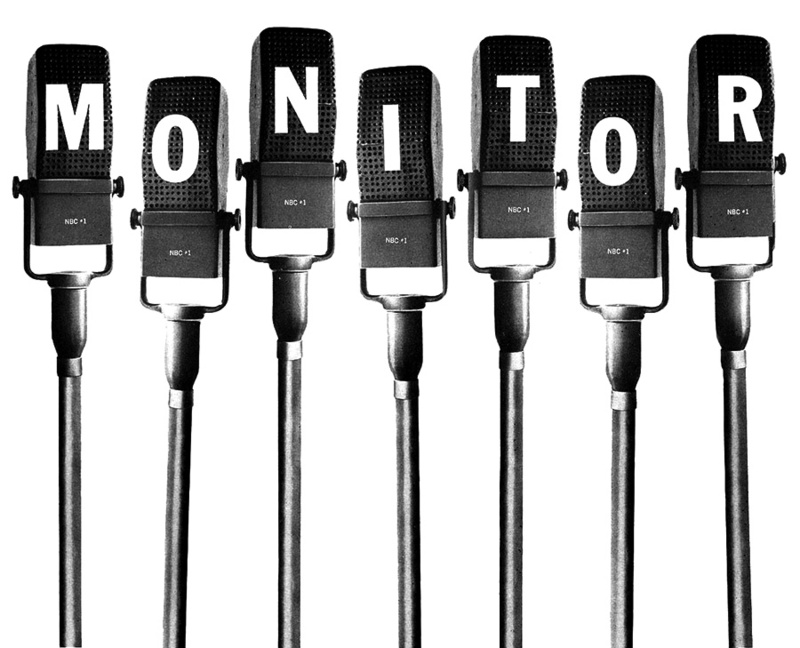 Monitor featured some well-known communicators, the term for the hosts, from both the news and and game show worlds. The communicators included people like Cindy Adams, Dave Garroway, John Cameron Swayze, Bill Cullen, Hugh Downs, Monty Hall and many, many more recognizable people. For additional WWII news coverage, see disk volume 1-4 of WWII Collection. Be the first to comment on "Monitor"